Elections maybe six months away, but Chhattisgarh Chief Minister Raman Singh is not taking any chances. The longest serving BJP chief minister has already conducted two yatras this year to gauge the public mood, and to tackle any possible anti-incumbency feeling against his third consecutive tenure. The opposition regrouping could make his electoral battle tougher this time. In the resource-rich state, dominated by tribal population, the BJP and the main opposition party—the Congress—have been able to retain their vote share in last three assembly elections. But, the difference between the BJP and the Congress vote share was only 0.7 per cent in 2013. So, it is crucial for Singh to tom-tom his initiatives in the backward state. 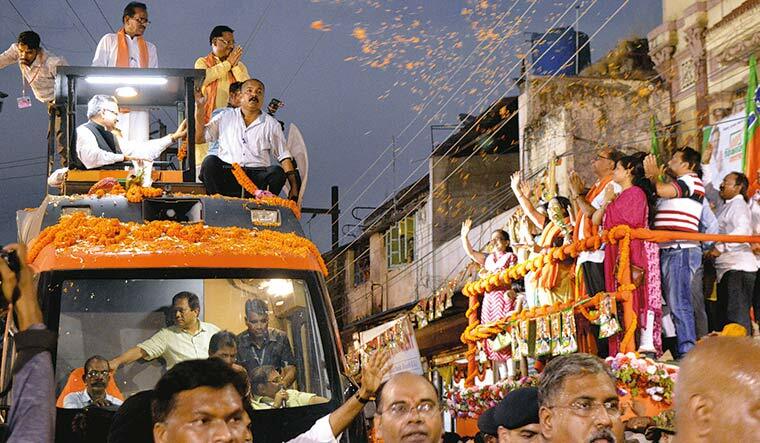 In his Dilip Chhabria-designed bulletproof bus, named Vikas Rath, the chief minister is visiting various constituencies. He is literally handing over letters and cheques of various government schemes, and people, particularly women, are flocking to his rallies with the hope of getting the largesse. Another innovative step taken by Singh is the crediting of bonuses to the bank accounts of farmers. “It is bonuses worth Rs 1,700 crore that we are distributing. It is a matter of great enthusiasm for the farmers as we are transferring their dues to their accounts [live during the rally], at the rate of Rs 300 per kilogram for paddy,” says Singh. The yatra is also the time to lay foundation stones for all possible projects, however small it maybe, before the model code of conduct kicks in. He has already committed projects worth Rs 30,000 crore. In his next phase of yatra in August, Singh will distribute 50 lakh smartphones, too. Among these, the major beneficiaries will be women, particularly below poverty line, and five lakh students, who may also be the first-time voters in the coming assembly elections. The opposition parties allege that the government is misusing state machinery for political gains. Singh says his election plank will be development—the network of roads he built and social welfare schemes he ran. He has a reason to start early and reach out to as many voters as possible. Now, with the possibility of Mayawati’s Bahujan Samaj Party allying with the Congress, it can tip the scales in their favour. Taking into account the 2013 elections, if the Congress and the BSP votes were to be added for each of the 90 constituencies, the state could go to the alliance. “The alliance will be decided by our central leadership,” said Congress state president Bhupesh Baghel. The state has ten seats reserved for the scheduled castes, of which nine are currently held by the BJP. Baghel said that people want change, and is confident that the Congress could dislodge the BJP government. He added that the Congress has been holding agitations and other programmes in support of farmers and the tribals. The contest in Chhattisgarh is primarily a bipolar one between the BJP and the Congress. But, many feel that the former Congress chief minister Ajit Jogi, who quit the party in 2016, could play the spoiler. He has a significant following among the tribal population of the state. Jogi is currently being treated for pneumonia in a private hospital in Gurugram. Amit Jogi, his son and a member of the legislative assembly, said that his father is recovering fast and will be discharged later this month, after which he would campaign. Despite the aversion of the state leadership of the Congress, its central leadership still has not given up on Jogi. Congress president Rahul Gandhi called up Jogi’s wife after he was admitted to hospital. But, it is yet to be seen if anything significant would emerge out of it. The BJP is traditionally strong in urban areas, and the Congress in tribal areas. Out of the 29 seats reserved for scheduled tribes, the Congress won 18 in 2013. Since then, the BJP has been focussing on the tribal belt. Prime Minister Narendra Modi launched Central schemes like Ayushman Bharat, from this region. During his visit on B.R. Ambedkar’s birth anniversary, on April 14, Modi bent down to offer footwear to a tribal woman, and that picture had gone viral. Ironically, the state government runs a scheme offering free footwear to members of tendu-leaf-collecting families. The RSS is strong in the tribal areas, and the BJP is hopeful of gaining the support of tribals with the help of the RSS. Despite all the welfare measures they are highlighting, the BJP leadership still feels that there is anti-incumbency. Singh said that he has his own feedback system, and added that many sitting MLAs may not get the tickets. A similar strategy helped the BJP to win the elections last time—the party had denied tickets to over a dozen of its MLAs to counter anti-incumbency.